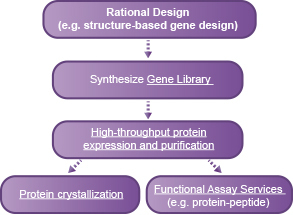 GenScript offers the most comprehensive portfolio of protein engineering related services, from library construction through antibody engineering, including large scale expression and crystallization. Our GenPlus™ Next-Gen technology, with a capacity >100Mbp/month, can cost-efficiently synthesize Gene Variant Libraries of any size for any research application. 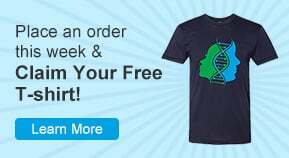 GenScript's patented OptimumGene™ algorithm provides superior enhancement of protein expression compared to heterologously-expressed native sequences or sequences optimized by other algorithms. To keep up with the increasing demand for engineered research antibodies, GenScript has launched a service for the high throughput production of a large number of engineered rAbs for antibody drug screening applications. 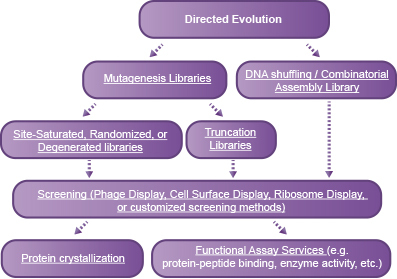 GenScript provides a comprehensive array of assay development services including protease target solutions, enzyme target solutions, lead optimization and biomolecular interactions. Genscript's fully customizable High Throughput Protein Variants Service has the capacity of delivering 1,000 protein variants within 30 business days. Our flexible platform integrates high throughput gene synthesis, mutagenesis, subcloning, pilot scale protein expression in E. coli, and 1-step protein purification. Two popular strategies for Protein Engineering are Rational Design or Directed Evolution. The workflows below indicate steps where GenScript's technical expertise may help fill gaps or add efficiency to your research program. One of our long-term clients partners with GenScript for large scale gene synthesis, protein expression and purification, and assay services to complement their in-house strengths of computational modeling. Solution: Synthesize many mutant sequences for rapid screening. A small North American biotech company was founded by scientists whose goal is to engineer novel biologic drugs, such as antibodies and growth factors for oncology and immunology, enzyme replacement therapies for genetic disorders, and myriad other therapeutic proteins. The company's expertise is in computational modeling of protein dynamics to design new or improved enzymes. Their virtual simulations allow them to predict which mutations will enhance protein stability, substrate affinity, enzymatic activity, or other key features that contribute to drug efficacy. 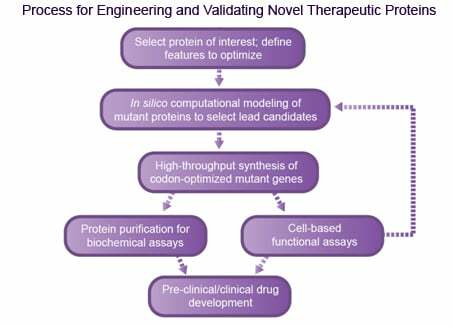 To validate their in silico mutagenesis, they need to synthesize the mutated sequences, express the proteins for biochemical characterization, and perform cell-based functional assays. Promising candidates can then be licensed to pharmaceutical companies that have the infrastructure to follow through with pre-clinical, potentially bringing new drugs to patients in need. Gene synthesis allows high-throughput, fast, accurate construction of mutant sequences that are then cloned into expression vectors. Gene synthesis also facilitates high-level protein expression through host cell-specific codon optimization, allowing rapid purification of sufficient quantities of protein for biochemical characterization. By outsourcing to GenScript, the industry leader in capacity and total automation of gene synthesis, this biotech client was able to speed up their R&D process, meet the deadlines from their pharmaceutical partners, and secure more funding from venture capital investors. GenScript is the most cited biotech company, with over 10,000 Peer-Reviewed Publications that cite our services and products. GenScript offers convenient online quote requests & ordering for most services. To talk to a Ph.D- level technical account manager about your specific project requirements, please call or email us. Our representatives are available 24 hours a day, Monday through Friday to assist you.